Just two more tasty treats to share with you from my list of Birthday goodies. Here is a version of a cupcake that will send kids of any age into a tizzy. 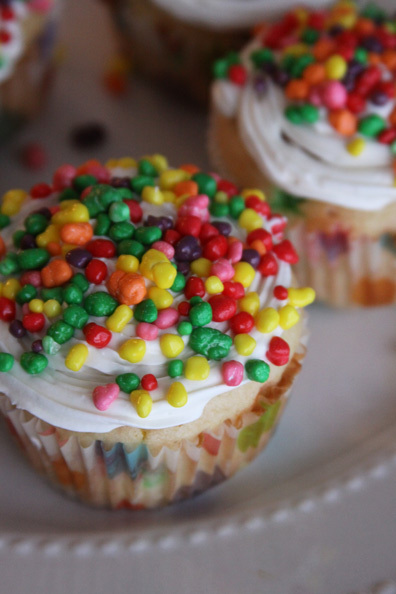 If you know anyone that loves Nerds candies you have got to make them a batch of these fun loving little cupcakes. What do you get when you combine a boxed cake mix, some frosting, and an entire box of Nerd candies? Sheer childhood dreams coming true, if you ask me. Who didn’t love dumping those little Nerd candies into their mouth as a kid? 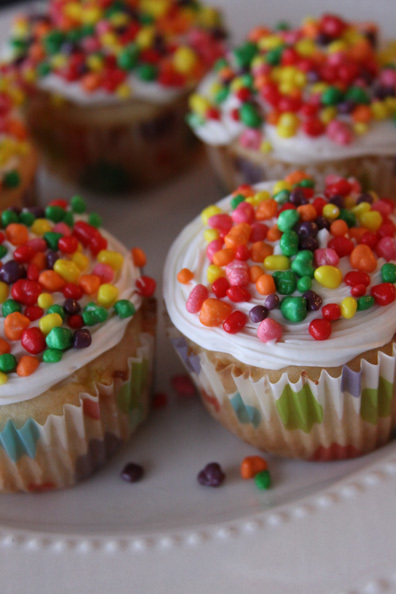 Now, infuse some cupcakes with them, frost that, and then dip the entire cupcake into a pile of candy. 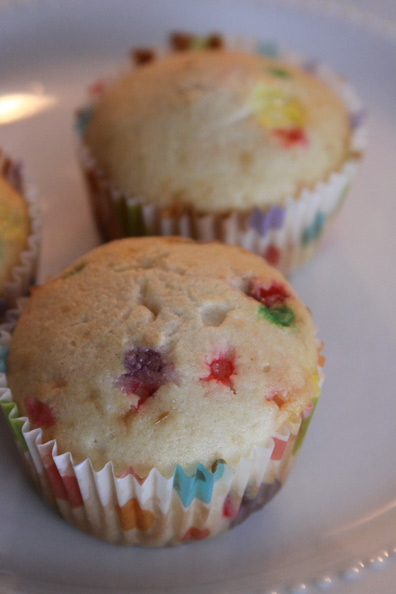 Add them to your cupcakes and you have a treat for a kid at any age or for an adult who is just a kid at heart! My little man really wanted to take a fun birthday treat to school to celebrate with all of his friends. When I asked him what kind he wanted, it took him a few days to decided. Then one night I spotted this recipe for Nerd Cupcakes on Moms Crazy Cooking. My son is a huge Nerd candy fan, and who can blame him? So I thought he might think these cupcakes were fun. The instant that his little eyes met the picture, I got that mouth open, wide eyed head nodding, yes paaaalllllllease! The recipe at Moms Crazy Cooking used a regular old white cake mix to make the cupcakes, and called for the Pioneer Woman’s white flour frosting. The combination of her light fluffy (less sweet) frosting sounds like it would pair perfectly with the Nerd candies on top. I had all of the ingredients to make it, but when it came time to get baking it was after 10 pm, and they needed to be done the next morning. Sooooo… you guessed it…I popped the lid on a tub of frosting and strayed from the recipe I was hoping to try. They turned out great non the less, and were so easy. First I made my boxed white cake mix according to the packages instructions. 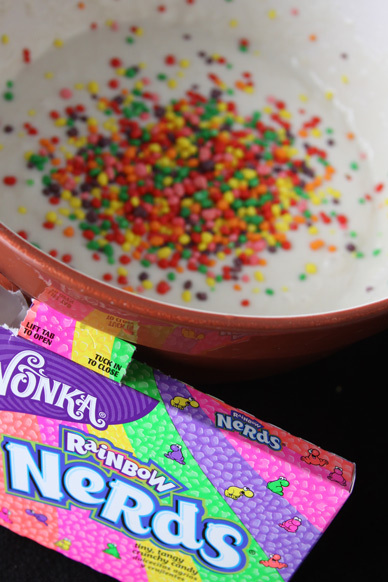 Then I proceeded to dump a little less than half of the box of Nerds into the batter and mixed them in by hand. After baking the cupcakes (also according to the package instructions) I was left with some adorable “polka dot” cupcakes. The Nerds turned the regular white cake mix into what almost looked like a confetti cake. The actual cupcake had just a hint of nerd flavor that was just right too. Next was the fun part. I piped on some good old whipped frosting and was ready to really turn the cupcakes into a child’s dream come true. I took a small plate and dumped the remaining Nerds onto it. 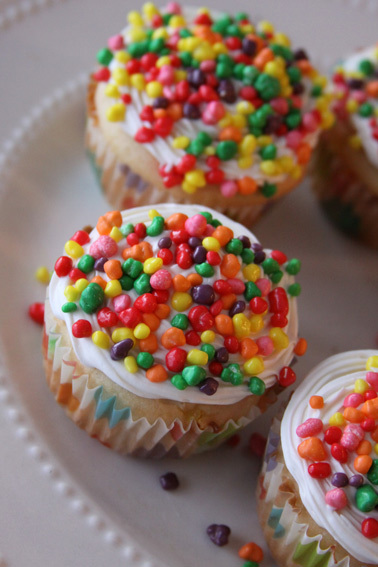 I then flipped over each cupcake and essentially dunked it into the plate full of Nerds to decorate the top. The Nerds made the most delightfully fun topping, and took no more time than and other plain jane cupcake. Let me just warn you…if you are taking these into your child’s classroom, be prepared to get swarmed instantly upon your arrival. As soon as I walked into the room with these cupcakes my son’s kindergarten class was wide eyed and shocked at the sight of a cupcake covered in Nerd candies. My son had such a great time sharing these at school, and all of his friends said they were great. The truest test is that their was not one left in the tray when I picked the little guy up, not even a stray Nerd candy was found anywhere. 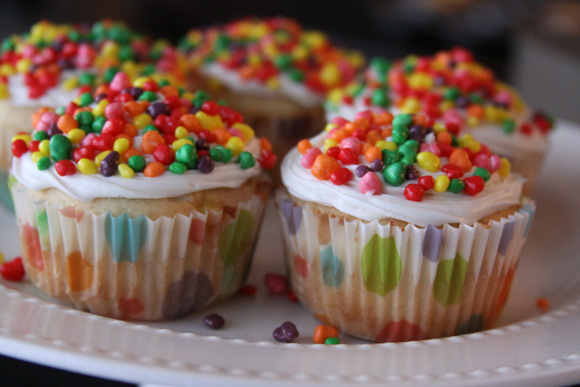 If you are looking for a fun way to serve up a cupcake, especially to a candy lover, give these a try!